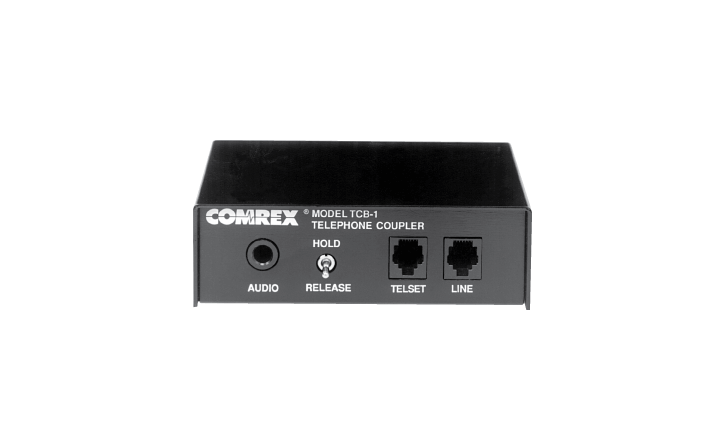 The Comrex TCB-1 Manual Telephone Coupler provides clean, transparent transformer connections from telephone lines to external audio equipment. State of the art circuits and rugged construction ensure highest quality and years of reliable service. Couplers feature modular jacks for quick installation by non-technical personnel. Comrex Telephone Couplers are designed and FCC registered specifically for broadcast use. Program may either be sent or received. For units that simultaneously send and receive audio, take a look at our Digital Hybrids. NOTE: TCB-1 is for North America use only. For units that can be used worldwide, please see Comrex Digital Hybrids. The TCB-1 provides a switched hold connection to a telephone line so that the telephone set may be hung up during program feeds. This eliminates the need for special telephone instruments with push-to-talk handsets or exclusion keys. Use with any modular phone to send or receive live or taped material. The TCB-1 does not interfere with normal use of the associated telephone instrument and does not require batteries or external power.